In Liberia, the ratio of students to textbooks is 28:1. Beautiful beaches, thanks to a 360 mile-long Atlantic coastline, moderate tropical weather, and a lush green cover to boast about. But unfortunately these are not the reasons Liberia is known for in the world. Liberia is famous for having one of the poorest capital cities of Monrovia, of ranking 177th out of 188 countries in the global HDI index, and for having one of the highest rates of out-of-school children in the world. It takes a lot of work to get to Liberia – four separate flights, depending on where you’re traveling from in the US. But as you circle over Roberts International Airport, named after the first president of Liberia, you are greeted with a green cover extending for miles, not something many countries can boast about anymore. Once in the city, you can’t help but notice the many, once-grand structures now lying in ruins, all signs of the brutal 14 years of civil war the country endured. This, combined with the signs warning about Ebola, makes you realize exactly how star crossed a country can be. With many families having lost loved ones in the war or to Ebola, the resilience and strength of the people in Liberia to be able to rise-up and start building their lives again is nothing less than extraordinary. The former President of Liberia’s house, now in ruins following 14 years of civil war. Under the leadership of President Sirleaf, the first woman president on the continent, the country is finally seeing some stability for the first time in years. The education sector, like everything else in Liberia, is being re-imagined. The current Minister of Education, George Werner, has been in the international spotlight for the Partnership Schools Liberia (PSL) initiative – a pilot allowing private players to manage a small number of public schools with the aim to scale to dramatically improve learning outcomes for children. Liberia has one of the highest rates of out-of-school children in the world. While the Partnership Schools initiative works to improve learning levels of children in school, the Luminos Fund, through its Speed School program, is looking to provide out-of-school children and over-age children in public schools a chance to get back to school together with children their own age. 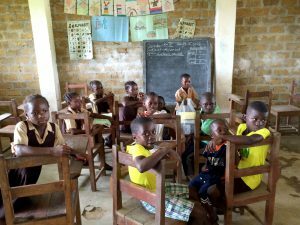 The Ebola outbreak caused government schools to shut down from June 2014-February 2015, exacerbating the country’s out-of-school problem. The Luminos Fund is humbled to be starting operations in Liberia with the support of the UBS Optimus Foundation and Dubai Cares. We aim to bring 40,000 children back to school over the course of 7 years and, in the process, we hope to develop an accelerated learning model for the country which can be adopted by the government or any other organization wishing to work in this space. On February 20th, we open classrooms in Bomi and Montserrado county with the help of 4 local implementing partners. In 2017, we will enable 2,000 children to become functionally literate and numerate and help their transition into their local government schools. On my last trip to Liberia, I visited a school with no furniture where children carried their chairs to and from home each day in order to have a place to sit and work. That kind of hunger for learning has to be honored. It’s a true privilege to have the chance to contribute to the rebuilding of this spirited country by helping its youngest citizens attain the knowledge for a brighter future.